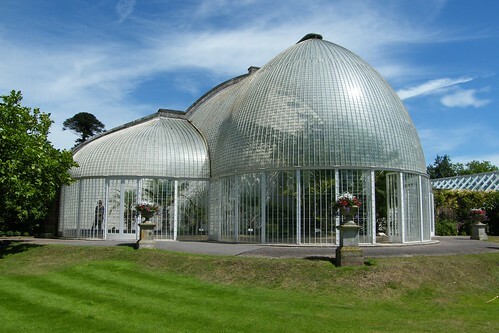 The British public may have been seduced by the great glass domes that are the Eden Project but the palm house at Bicton still remains one of the most remarkable and beautiful glass buildings in the country. Its curvilinear trefoil shape is spectacular. Built around 1818, the technology of its construction was so advanced for its time that even today, the glass firm of Pilkintons are hesitant to take on its restoration. “If anything went wrong or got damaged, we just wouldn’t know how to put it together again,” they said. The genius behind the Palm House’s design is almost certainly John Claudius Loudon, in whose book, Greenhouse Companion, several similar designs appear. He had been experimenting with the building of glass domes and half domes since 1815 and invariably used the London firm of W & D Bailey to construct them. In 1818 he sold them the rights to his designs and the use of the wrought iron sash bar he had developed. What causes such wonderment on entering is the fact that the whole central dome is completely unsupported. Loudon himself was proud. “It is worthy of remark”, he said, “that there were no rafters or principal ribs for strengthening the roof besides the common wrought iron sash bar.” In consequence the dome resembles a gigantic glittering spiders web suspended across the sky. The whole building is held together with pressure alone and only became a stable structure when the glass was fitted in. The panes overlap each other like fish scales and each one is hand moulded thicker at the edges than in the middle. Thus the rain is deflected from the iron ribs. At the time it was built, glass manufacturers charged their customers by surface area but were taxed themselves by the weight of the glass. For that reason they made the thinnest glass possible, large pieces of which were extremely fragile. To use small panes for the palm house at Bicton was a practical solution. It also meant that the structure would be curved, without the panes themselves being curved. To build a glass house of this size in the first half of the 19th century was an extravagant venture because of window tax. Lord (John) Rolle however, who inherited Bicton House and its estate in 1796 and lived there until his death in 1842, was undeterred. The Rolle family had become the largest landowners in Devon following a fortuitous marriage a century before and in consequence were rich as Croesus. Their gardens and grounds were celebrated throughout the south west of England and included a formal Italian garden laid out in 1735, supposedly by Le Notre, with elaborate watercourses, terraces and parterres . But it was Louisa Trefusis , John Rolle’s second wife who was the driving force behind Bicton’s nineteenth century transformation. She was obsessed with landscape gardening and her husband was happy to indulge her. In 1812 a large lake was dug out below the house by French prisoners. The palm house followed , then the arboretum, the pinetum and the monkey-puzzle avenue . Louisa also created a shell house, a hermitage, a fernery ,an American garden and, when her husband died, she built a church built in his memory. Her gardener Mr Barnes was a hard task master. If one of his workforce took a wheelbarrow with a dirty wheel onto one of the walks or came to work on a Monday with a dirty shirt or with his shoes unlaced, he was fined 3d. Bicton House is now an agricultural college. The gardens and grounds are open everyday 10am to 6pm.